At the recent Digi-Festa event, the staff of the series announced a Blu-ray boxset of the second Digimon Adventure anime, Digimon Adventure 02, which will be releasing next year. Additionally, the first details about the Blu-ray for the first episode of Digimon Adventure tri. was also revealed. 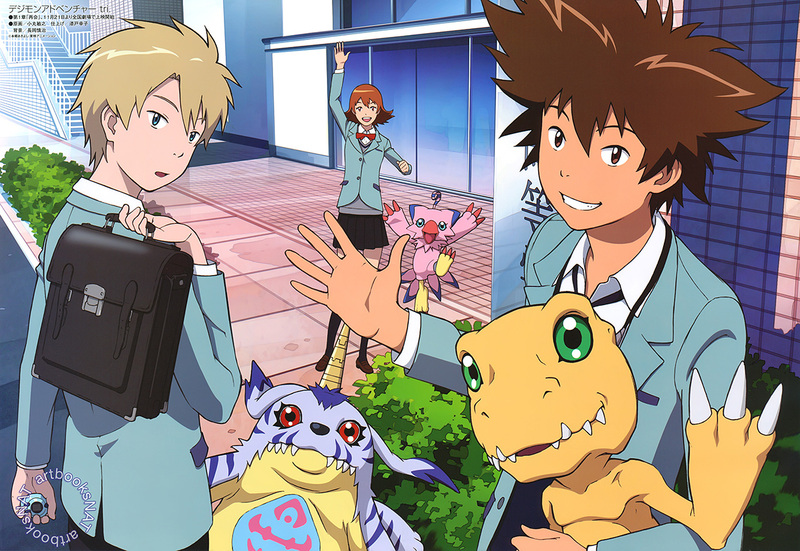 The first details about the Blu-ray release of the first Digimon Adventure tri. anime has been revealed. The first of six episodes, Saikai (Reunion), releasing in Japanese cinemas from November 21st this year. The Blu-ray will release on December 18 for ¥8,000 (~ $64.30 USD) whilst the DVD release will sell for ¥7,000 (~ $56.25 USD). Early orders of the release will contain a special transparent sleeve and digipak and a theatre brochure. In addition to the theatrical episode, there will also be other bonuses that will be announced soon. The latest issue of Animedia has released a brand new visual that features Taichi “Tai” Yagami with Agumon, Yamato “Matt” Ishida with Gabumon, and Sora Takenouchi with Biyomon. The magazine also has another visual with information about the main Digi-Destined. Yagami Hikari – 2nd year in middle school. She’s popular with the boys in her brother’s soccer club due to her cute charm. She loves ice cream. Her Digimon partner is Tailmon. Takaishi Takeru – 2nd year in middle school. He appears to be popular with the girls in school. While he lives separately from his brother due to their parents’ circumstances, they get along very well. His Digimon partner is Patamon. Ishida Yamato – 2nd year in high school. Even as a high school student, he continues to be in a band as bass and vocals, as he had in middle school. His Digimon partner is Gabumon. Takenouchi Sora – 2nd year in high school. She acts as the “big sister” who organizes/settles the group of Chosen Children. She is classmates with Taichi. Her Digimon partner is Piyomon. Yagami Taichi – 2nd year in high school. He is part of the soccer club in school and continues to fervently train for soccer every day, but lately has started to decide on his career path. His Digimon partner is Agumon. Tachikawa Mimi – 1st year in high school. She has a cheerful, expressive personality. Currently she is living away from Japan, in America. Her Digimon partner is Palmon. Kido Jou- 3rd year in high school. He attends prep school to prepare for university exams and is engrossed with studying daily but worries because he isn’t getting the grades that he wants. His Digimon partner is Gomamon. Izumi Koushiro- 1st year in high school. He is skilled at computers and has both the ability to analyze and understand situations. Sometimes he gets so absorbed with what’s in front of him that he ignores everything else. His Digimon partner is Tentomon. Digimon Adventure tri. will be a 6 part anime film series with the first episode releasing in Japan on November 21st this year. The Blu-ray release of the episode will release on December 18. Tags: 15th Anniversary, 2015, 2015 Digimon Adventure Anime, Agumon, anime, Animedia, Ayumi Miyazaki, ＢＤ, blu ray, Blu-ray Boxset, boxset, Brave Heart, Butter-Fly, Chika Sakamoto, Digimon, Digimon Adventure, Digimon Adventure 02, Digimon Adventure Sequel, Digimon Adventure Tri, Digital Monsters, Gabumon, Gomamon, Hitomi Yoshida, images, Junko Takeuchi, Junya Enoki, Junya Ikeda, Katori Shigematsu, Kinoko Yamada, Kyouji Wada, Mao Ichimichi, Matt Ishida, Mayumi Yamaguchi, Miwa Matsumoto, Mutsumi Tamura, Natsuki Hanae, Palmon, Patamon, Piyomon, sequel, Spring 2015, Suzuko Mimori, synopsis, Tai, Tai Kamiya, Tailmon, Takahiro Sakurai, Tentomon, TK Takaishi, Toei Animation, Yamato Ishida, Yoshimasa Hosoya, Yuka Tokumitsu, デジタルモンスター, デジモン, デジモンアドベンチャー tri.